Travel to Singapore in Hitman 2's Sniper Assassin mode as the new location debuts next week. Looking to take down some new targets in Hitman 2? Warner Bros. Interactive Entertainment and IO Interactive have you covered. Hitman 2 is welcoming the new Hantu Port Sniper Assassin Map, a new DLC pack coming next week. You may remember that Sniper Assassin mode is a standalone co-ip experience where players can work together and take out targets outside of the regular game together via online co-op or solo as the operatives Stone and Knight. This DLC finds Han Ldong and his wife, kidnapped by a group of criminals known as the Heavenly Guard, who need to be rescued. Time is quickly running out, however, as players have to rush to take out these new targets before they transfer their unwitting hostages to a cargo ship not too far away. If it sounds like a frantic affair, that's because it is. 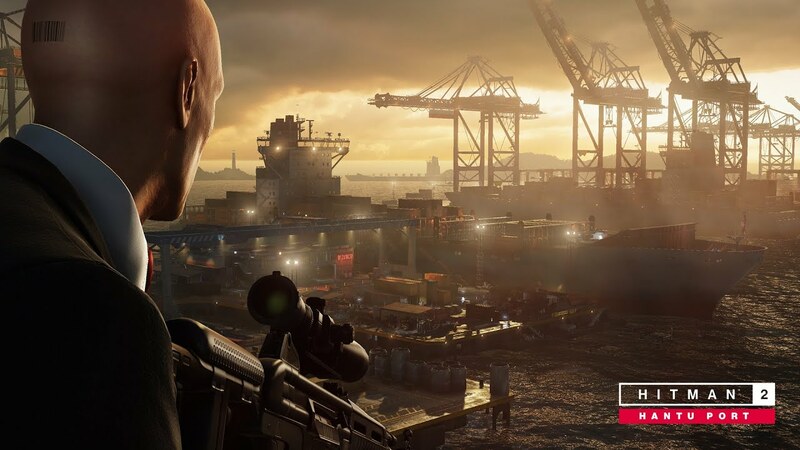 The Hantu Port Sniper Assassin map is part of the Hitman 2 Expansion Pass, which comes with two Expansion Packs, including new missions, locations, sniper maps, challenges, weapons, and outfits to choose from. If you haven't tried Hitman 2 just yet, we definitely recommend doing so. "Through all of the complex machinations and staggering amount of opportunities within its levels, Hitman 2 manages to be a game with one surprisingly simple demand: think things through. As it is in life, perception and consideration go a very long way here, and players who are willing to put in the proper amount of time and effort will see just how perplexing, engaging, and rewarding stealth action games can be. Hitman 2 will undoubtedly serve to define the stealth genre for years to come, and I can't wait to see where IO Interactive takes the series next." You can embark on the new Hantu Port Sniper Assassin mission on March 26.